GORDON HUNTER believes a “same again” defence can be the rock upon which Hibs’ promotion bid can be built. The return of goalkeeper Mark Oxley on a two-year deal means boss Alan Stubbs can look forward to the new season with the back line which proved to be second only to title winners Hearts in conceding less than a goal a game in their 36 Championship matches. Stubbs has already said he wants to see that impressive record improved upon but, while that may seem a tall order, former Hibs defender Hunter sees no reason why – with Oxley lining up again behind a back four of David Gray, Paul Hanlon, Liam Fontaine and Lewis Stevenson – the head coach’s target can’t be realised. A veteran of more than 400 games in a green-and-white shirt, the vast majority of them in central defence, Hunter knows the need to forge solid partnerships having done so throughout his own career which saw him begin as a raw 16-year-old alongside the likes of Jackie McNamara, John Blackley and Erich Schaedler. 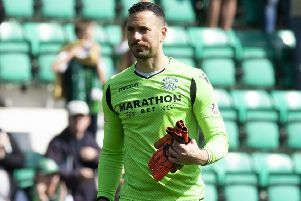 Pointing to Hibs’ stuttering start last season as Stubbs faced a race against time to pull a team together, Hunter said: “It was a bit of a shame but the longer the season went on and the more game time they got together, the better they looked. “And, as a manager, if you get a good settled back four and goalkeeper you want to stick with it. You really don’t want to go making changes. Obviously, the more you play together, the better your understanding of how each other plays, what your strengths and weaknesses are and how you can complement each other. Hibs’ back four now has a familiar look about it, one which Hunter insists most managers would be more than happy with, a unit with a blend of youth and experience. And, he believes, the arrival of Liam Fontaine has helped bring out the best in Paul Hanlon. He said: “Fontaine has really impressed me, a totally reliable defender. I don’t think people realise Hanlon is still only 24 because he made the breakthrough at such a young age. When I first came into the team I played at right back for a spell but centre-half isn’t an easy position to play. I was lucky in having guys like Jackie, John and Gordon Rae and the experience of Fontaine will undoubtedly have helped Hanlon. “Gray is another who looks a right good player. Despite coming from this area, I’d imagine few knew much about him since he went down to England as a teenager but he had an outstanding first season and Stubbs will be delighted to have him extend his contract. Lewis Stevenson was probably one of the players of the season. “He went through a spell when managers didn’t quite seem to know what was his best position – he even played right back at times – but he’s settled down on the left, he knows his strengths and plays to them and that’s probably why he enjoyed what he himself says was his best season at the club. Hunter admits he was “spoiled” in having the likes of Alan Rough, Andy Goram, John Burridge and Jim Leighton behind him for the majority of his career but he believes signing Oxley on a permanent deal following his loan spell will prove a shrewd move. He said: “He’s still young as a goalkeeper so he can only get better. I think that’s one area Hibs have struggled to fill for a number of years. I played alongside exceptional goalies in Roughie, Andy, Budgie and Jim. They were all fantastic shot-stoppers and you knew that if anyone got past you there was a fair chance they’d make the save. “But since I left the club, with one or two exceptions, there’s never been a consistent goalkeeper. We seem to have had a new keeper almost every year. There’s not been one whose been at the club for four or five years. You do need that bit of stability and the fact Oxley and his back four know each other well can only be an advantage.